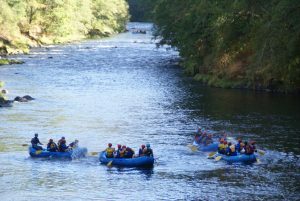 The Clackamas River Rafting Trip is Portland's most accessible white water adventure and a great way to experience the thrilling outdoors of Oregon with 3 different options to choose from. Closest white water rafting trip to Portland. Family friendly, class II rapids on the Lower Clackamas. Exciting class III rapids great for everyone on the Upper Clackamas summer rapids. Beautiful scenery with great swimming opportunities and fun rapids year round. Our most popular day trip and for good reason. With the closest full day rafting to Portland, most people don't know that a mountain canyon filled with pines and roaring rapids awaits them for adventure. This trip experiences the upper section starting at 3 Lynx Bridge and continues down river for over 13 miles through over 15 rapids along tree lined banks and creeks spilling into the river. Part way through the day we will pull over to meet our photographer for a freshly prepared river side lunch. After resting a bit and delighting yourself in the beautiful surroundings, we take off to splash our way further down the river, ending the day usually around 4:00 PM back at your car/meeting location. The Clackamas River Excursion is for those who want some excitement, but don't quite have enough time to take full advantage of the beautiful river. This section of the river is about a 7 mile trip that includes 8 rapids. 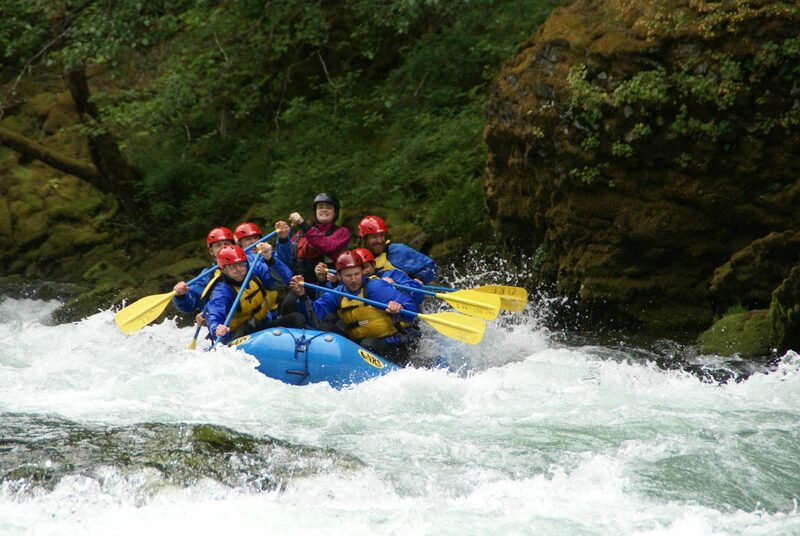 Its a great way to enjoy some of the beauty of the Pacific NW and still get to have a memorable splashing good time. Our trips include free of extra charges your wetsuit, splash jacket and booties* to make life easier for you and planning. *(ONLY APRIL-JUNE 30). This is the perfect trip for those who just have a little bit of time or for those new to rafting or with smaller kids. With our meeting location only 45 minutes from downtown Portland, anyone can fit this trip in during the busy summer. With quite a few surprising class II/II+ rapids this short 6 mile section still has plenty splash and giggle. Also, the plentiful swimming spots make this a great way to get out and play in the river. Minimum total trip size is 4 for Clackamas River Trips. If your group (combined with other groups who have requested the same trip) together total less than 4 then your reservation will be on hold until the minimum trip size is met. Your credit card will not be charged until trip is confirmed. Before you book you may want to review our deposit, cancellation, and refund policies. You can find them here. Recommended minimum age is 5 for lower section, 7 for upper section. Spring trips/high water may require older. Youth pricing is for 12 & under when accompanied by an adult. Prices include all taxes & fees. 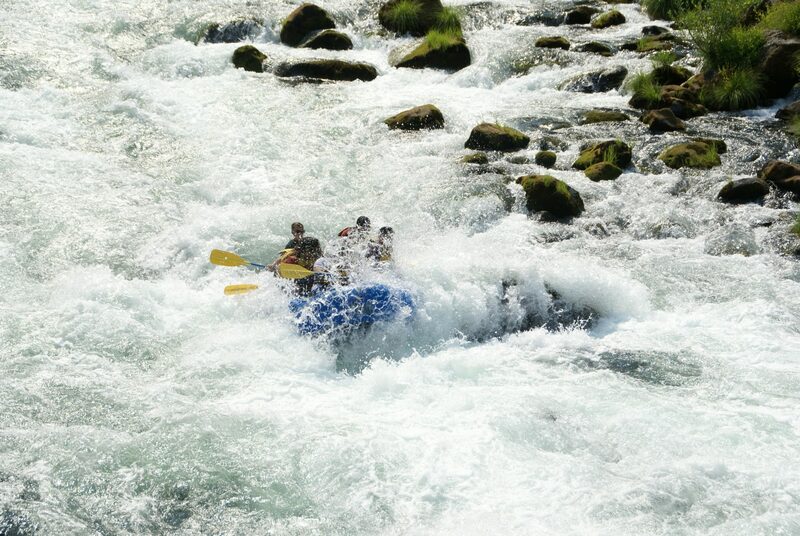 Thrilling whitewater in the spring. A great family trip in the summer. Close to Portland yet uncrowded. Photos taken of your trip. Good camping and hiking nearby. Close to Mt Hood and Columbia River Gorge waterfalls..
"What a excellent adventure. We started at the Lompoc Oaks Bottom Public House with a great beer. We then headed by van up the Clackamas river to our put-in at Hole in the Wall. The float down the river was so much fun. Our guide Kaelan, had a story for every rapid. The take-out was at Moore Creek. We finished the trip back at Lompoc with a beer flight and dinner!" Full day trip was excellent! "Our full day trip down the Clackamas river was an awesome experience. Everyone had a blast! Out guide, Scout, was super knowledgeable and pleasant - she fit right in with the family. We experienced not only the thrill but also the quiet and beauty of the area. Scout also shared fun games on the river and suggested many a great swim. I also highly encourage to book the photo package! They are memorable!!" "We all had a great time, the river was beautiful, guide very knowledgeable and they took amazing pictures of us for a good price! Would definitely recommend ORE!!"